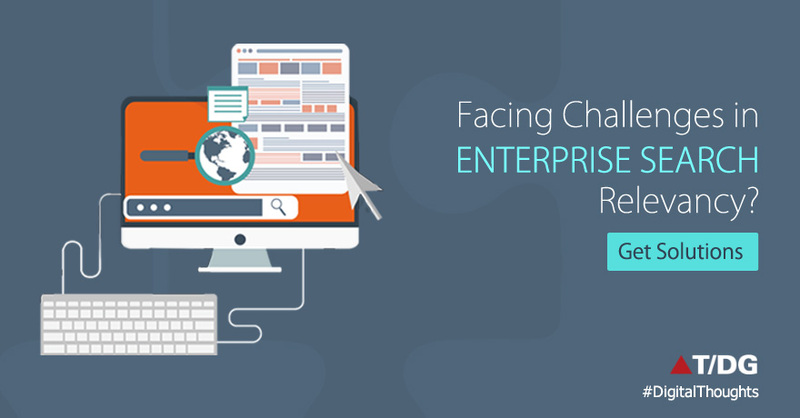 When enterprise searches are built from scratch, evaluation of the search quality remains key challenges of organizations implementing it. It always gives a feel of living in the darkness all the time. Such implementations demand enormous efforts and time. 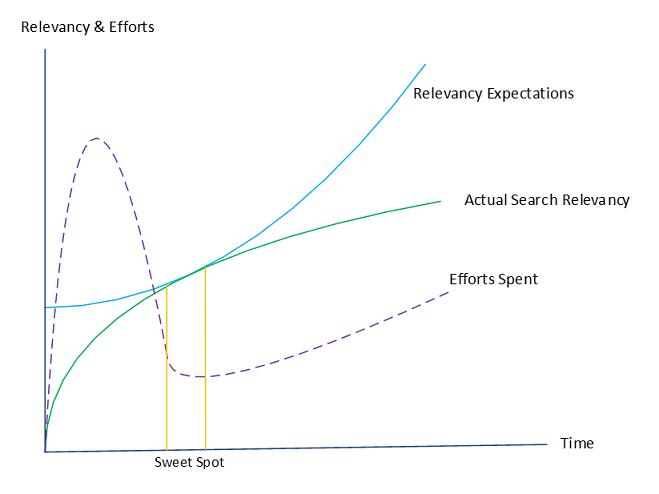 The chart below demonstrates a typical challenging situation in which organizations invest and work consistently on maturing the quality of searches over time, and yet remain far from satisfaction. To address the relevancy demands, organizations use various approaches. The challenge lies in reliability of these approaches given the subjective assessment of relevancy done by individuals and groups. Search relevancy should be evaluated against the information expected and not against the query, nor term matches. Unfortunately, most of the search tools like Apache Lucene/Solr, Elastic Search today, are based on keyword matches, which do not solve complex relevancy challenges. Hence we observe a huge demand for customizing searches. To set the expectations for Enterprise Search, one needs to set the Relevancy Judgments or Relevancy Benchmarks, a process of collecting relevancy information from humans, that best represents predicted usage of the system. I will go over some of the approaches in this blog. One of the key aspects for determining quality of search relevancy is to evaluate its performance over sample queries. Many organizations consider TREC and Cranfield based listed public evaluations. They do serve a good purpose for refining the relevancy, however, that cannot be considered as the only valid criteria for Relevancy Benchmarking. In this mechanism, relevancy benchmarks are captured over a subset of top k results from multiple domain experts. 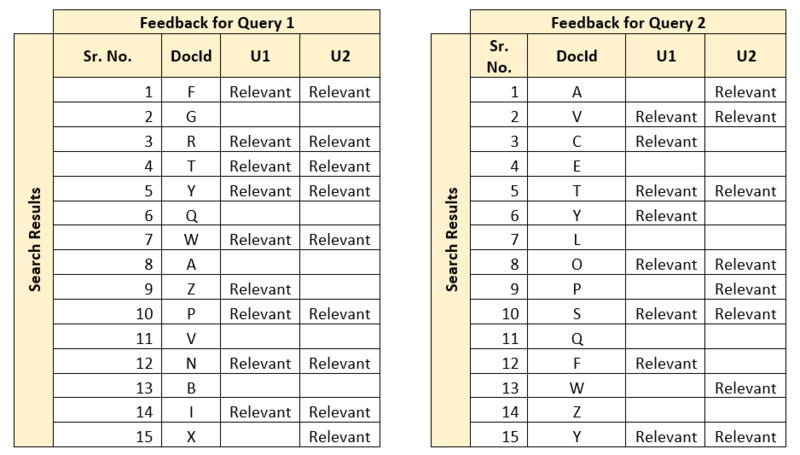 This can contribute and define the golden standards used while benchmarking search performance. An important aspect is to categorically identify, consolidate and define a single representation for unit. Since multiple experts evaluate the results, one mechanism is to measure their agreement levels, and take a decision on the given dataset. Below example shows two sample queries, with user (U1 and U2) agreements. DocId shows information in the document. Once this information is captured, the agreement between these users can be found out through average, or a more robust statistical measure called Cohen’s Kappa Coefficient. 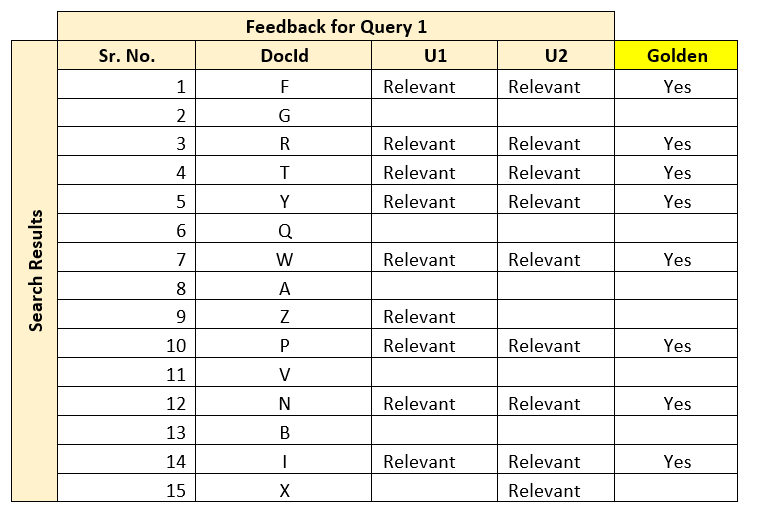 To do that, first the relevant and irrelevant results need to be listed in a matrix format as shown below. Once your golden dataset is formed over multiple iterations, it can be established as a Relevancy Benchmark for future search application tuning. Although this mechanism works well in general, some factors such as quality of users (whether they really represent the audience), their domain knowledge and expertise, etc. can impact the quality of the system. In part 2, we will go over the other strategies to benchmark relevancy judgments and various relevancy measures.